We’d love your help. Let us know what’s wrong with this preview of Celeste by Johnny Worthen. In book two of this remarkable series, the sleepy little town of Jamesford becomes a national battleground of faith and science, hatred and hope. Eleanor—the girl whose life depends on not being noticed—is at the center of it all. Trusting David with the secret of what she is, Eleanor tries to keep the promise she made her mother to rejoin humanity, even if Eleanor might n In book two of this remarkable series, the sleepy little town of Jamesford becomes a national battleground of faith and science, hatred and hope. To ask other readers questions about Celeste, please sign up. Every bit as good as the first book! Eleanor seems to have found a place to settle, but her desire to be "unseen" is becoming more and more difficult. When Celeste disappears and a picture of Eleanor appears on the news, Celeste's parents come to find Eleanor. Meanwhile, David's father, an abusive alcoholic, returns from active duty, and everything Eleanor has worked for is turned upside-down. The only disappointing thing about this book is having to wait until the last book in the trilogy comes Every bit as good as the first book! Eleanor seems to have found a place to settle, but her desire to be "unseen" is becoming more and more difficult. When Celeste disappears and a picture of Eleanor appears on the news, Celeste's parents come to find Eleanor. Meanwhile, David's father, an abusive alcoholic, returns from active duty, and everything Eleanor has worked for is turned upside-down. I had the privilege of reading an advanced copy of this brilliant book as part of the publication process. Johnny has done what many authors struggle with: book two in a trilogy that is just as compelling as the first. Now I must wait for its official release to get my own copy. I like where he took Eleanor's story. Do you know why I love Johnny Worthen’s books? It’s because they pull you right into the story and then they keep you hostage until you’ve finished the book. It doesn’t matter what book of his you read and what genre they happen to fall into, you’re always right at the center of things. That, my friends, is the mark of a truly great author. Instead of reviewing each book individually (as I did with Eleanor), I decided to rather write a bit of a mini essay on why I love the trilogy in a whole. It’ Do you know why I love Johnny Worthen’s books? It’s because they pull you right into the story and then they keep you hostage until you’ve finished the book. It doesn’t matter what book of his you read and what genre they happen to fall into, you’re always right at the center of things. That, my friends, is the mark of a truly great author. Instead of reviewing each book individually (as I did with Eleanor), I decided to rather write a bit of a mini essay on why I love the trilogy in a whole. It’s a bit different to what I usually do, but then again, this trilogy deserves something special. Layered with mystery and intrigue, magic and drama, as well as romance, The Unseen Trilogy has everything a reader could ever want.The messages that Worthen painstakingly hides between the lines are so relevant today, it’s unbelievable that he was able to work them into a YA series. And considering how watered down some YA books are these days, this trilogy is a breath of fresh air. Personally, I L-O-V-E this The Unseen Trilogy. Why? Because the books are written intelligently enough not to offend young readers by suggesting they’re stupid, because adults can enjoy these books as well, and because the books handle with important subject matters without rubbing it in your face. These books are a must-read! YA-lovers will enjoy the books for the good writing and well-crafted plot. Teenagers in general will be able to relate to the characters and the situations described in the books. Adult readers will love reminiscing about their own teenage years (and how the majority of them felt like outcasts). And paranormal readers will be thrilled to enjoy a shifter novel that deals with something other than werewolves and is plausible (if you’re into Native American mythology, of course). Every bookcase should feature this trilogy in a collection. Period. A great sequel to Eleanor. We meet the girl that Eleanor became and what happens when Eleanor is found out and mistaken for Celeste. The descriptions of David and Eleanor kissing are so descriptive, you imagine Johnny wrote them when he was a teenager making out with his girl. But. The book is not without its flaws. When you write, you need to make everything believable and Johnny misses some things such as Eleanor and the Venn's sitting down to watch college football on Saturday in January. Or a A great sequel to Eleanor. We meet the girl that Eleanor became and what happens when Eleanor is found out and mistaken for Celeste. The descriptions of David and Eleanor kissing are so descriptive, you imagine Johnny wrote them when he was a teenager making out with his girl. But. The book is not without its flaws. When you write, you need to make everything believable and Johnny misses some things such as Eleanor and the Venn's sitting down to watch college football on Saturday in January. Or a Congressman in Nebraska pressuring a local Sheriff and state child services in Wyoming. Eleanor thinks life is finally going to settle down. She's got friends at school, a boyfriend who loves her, and enough money left to her by her adopted mother to see her through till graduation. She knows how to pass as human, and she is beginning to believe that people aren't so bad. But when Eleanor goes back to get her "DNA update" from Celeste, she is seen by Celeste's abusive father. And when Celeste goes missing, her parents begin a hunt that will bring them to Jamesford, along with a vio Eleanor thinks life is finally going to settle down. She's got friends at school, a boyfriend who loves her, and enough money left to her by her adopted mother to see her through till graduation. She knows how to pass as human, and she is beginning to believe that people aren't so bad. But when Eleanor goes back to get her "DNA update" from Celeste, she is seen by Celeste's abusive father. And when Celeste goes missing, her parents begin a hunt that will bring them to Jamesford, along with a violent religious cult, an egomaniac scientist, and others who are bent on Eleanor's destruction. Jamesford becomes a battlefield, and Eleanor, David, and his family are caught in the maelstrom. Eleanor is a monster. She has to decide who to trust. Her mother is dead. Her boyfriend gets sick at the thought of her. Her friends want her to do magic for them. The Indians killed her family. The social worker wants to send her out of state. There is a family wanting her to be their lost daughter. A doctor thinks she is made of stem cells and wants to harvest her. Is there no peace? Can she just live her own life? WARNING: This is the second book of a series and the third one isn’t out yet! It Eleanor is a monster. She has to decide who to trust. Her mother is dead. Her boyfriend gets sick at the thought of her. Her friends want her to do magic for them. The Indians killed her family. The social worker wants to send her out of state. There is a family wanting her to be their lost daughter. A doctor thinks she is made of stem cells and wants to harvest her. Is there no peace? Can she just live her own life? WARNING: This is the second book of a series and the third one isn’t out yet! It is pure punishment to read it without being able to finish the story. Where Eleanor is a subtle unfolding mystery, Celeste is a bullet train! Once this book starts the plot doesn't slow down as Eleanor's secret becomes even more necessary to hide and the danger of what she could lose grows. A great compliment to the first book, although the sudden change in pacing and beautiful ambiance from the first book may leave some readers wanting. Still, it is a must read that sets up the third book perfectly. I fell in love with Eleanor in book one. I picked up Celeste simply because I wanted to know more about Eleanor. Never would I have guessed that not only would I love Eleanor more, but I would become attached to many of the other characters as well. This book kept me on my toes with the turn of every page. I am depressed that I'm done reading it. I will pick it up again soon. Eleanor was an awesome book but pales in comparison to this novel. The plots, the secrets, all masterfully done. I would recommend this series to almost anyone. Now I just need the next book to release. This book was just as good as the first one. Eleanor is an amazing character, unlike any other I've read, and I am completely fascinated by her. This series has me hooked and I have to get my hands on the third book asap. The second book in the Unseen trilogy was just as satisfying as the first book. The characters become more fleshed out and the tension increases. This is one of those books that could keep a voracious reader up all hours of the night. Definitely a must read if you enjoy paranormal YA fiction. More like 3.5. I tend to find middle-of-the trilogy books to be less about carrying on the first story as setting up for the next. In all, I liked Celeste, but not quite as much as I enjoyed Eleanor. Great story. I loved it a lot more than I thought I would. It was very interesting. It's nicely paced and the minute details that were added into the story made it feel realistic. Great second installment in The Unseen series! I can't wait for book three to come out in April--especially since Worthen left the book with an intense cliff hanger! 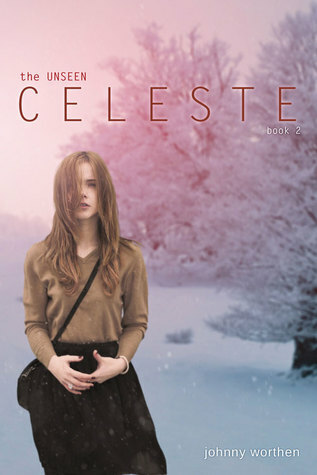 CELESTE, THE UNSEEN BOOK 2, continues Eleanor’s story as she tries to maintain a life in Jamesford, while distant events and local suspicion conspire to threaten everything. DAVID, THE UNSEEN BOOK 3, sees the powerful transformative conclusion of this awarding series as Eleanor learns her past and builds her future. Johnny’s entry into mystery with THE BRAND DEMAND won a Silver Quill Award from the League of Utah Writers in the best novel category, while, his genre-bending comedy noire, THE FINGER TRAP, introduces Tony Flaner, a flawed slacker every-man detective who can’t throw a punch but can slay a room with sarcasm. Johnny's short stories appear in a number of anthologies including the Dark Fiction LITTLE VISIBLE DELIGHT (The Point), Utah Horror, OLD SCRATCH AND OWL HOOTS (Keep Sweet), IT CAME FROM THE GREAT SALT LAKE (May 15th), Utah Fantasy, SECRETS & DOORS (A Thousand Secret Doors), HIDDEN IN PLAIN SIGHT (The Lost Curse of the Witch's Nest) and the limited edition commemorate Salt Lake Comic Con anthology HEROIC: TALES OF THE EXTRAORDINARY (The Grape Whisperer).